Does anything scream "summer" more than a pasta salad? I don't think so. Unfortunately, sometimes we get pretty tired of the same old recipes -- macaroni salad with mayo and tuna, basil pesto salad with tomatoes, vegetable pasta salad with Italian vinaigrette... can you say hum-drum? That's where this delicious vegetable-forward pasta salad comes into play. If you like Thai food, there's a good chance you'll develop an affection for this fresh summer salad. 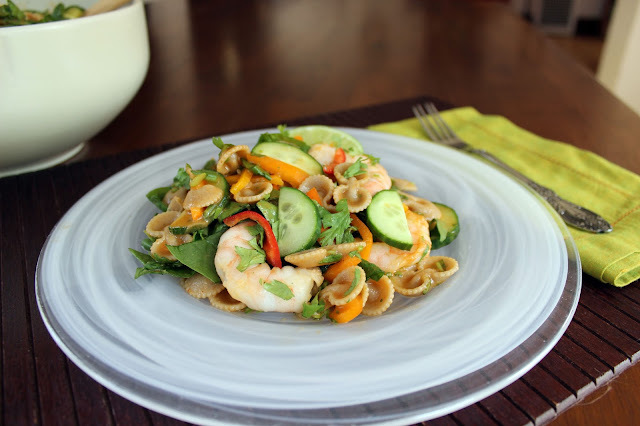 It uses hearty whole wheat pasta, briny shrimp, crunchy cucumbers, flavorful sweet peppers, and tender spinach leaves -- all coated with a light Thai-style coconut curry dressing with plenty of lime juice to keep things fresh and bright. It's crisp and flavorful ... perfect for hot summer days when the mere thought of turning on your oven makes you sweat. But before you run off to make the recipe, you might want to read a bit further. This recipe was created for the Hodgson Mill "Summer Pastabilities" contest. Hodgson Mill provided us with the Whole Wheat Bow Ties for the recipe. They've also given us a link to share with you to get a $1 off coupon for your next purchase of healthy whole grain pasta (including gluten-free varieties). For your chance to win, all you have to do is tell us which pasta you'd use first -- and what you'd make with it. Giveaway ends on Thursday, August 15, 2013 at 11:59 p.m. Winners will be chosen at random and notified by email, so please leave your email addy with your comment if it's not included with your Blogger profile. To make the dressing, whisk together the coconut milk, lime juice, fish sauce, red curry paste and brown sugar in a bowl until the sugar is dissolved and the ingredients are well incorporated. Add the lime juice, and lime zest and whisk again. Season to taste with salt and pepper. To make the pasta, bring a large pot of salted water to a boil, add the bow ties, and cook until al dente, approximately 8 minutes. Drain the pasta and immediately run plenty of cold water over it until it is completely cool. Drain well. Put the pasta in a large bowl, and, using a rubber spatula, fold in enough dressing to coat it generously. Gently fold in the shrimp and vegetables, adding more dressing as needed to coat. Do ahead: You can cook the pasta a few hours ahead, run cold water over it and drain. Spread the pasta in a single layer over a lightly oiled baking sheet. Cover the pasta with plastic wrap and refrigerate. The dressing can also be made earlier in the day; but keep it separate and toss the pasta salad with the dressing just before serving. 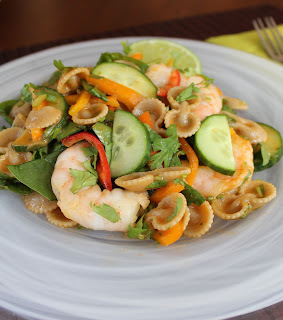 Very tasty idea for a pasta salad (minus the shrimp of course ;-)) I was very interested to see what this recipe was going to be like when I saw this post come up in my reader. Years ago I had made a "bow Thai" recipe (that also had shrimp in it that I left out) that was a Thai-style pesto of cilanrto, peanuts, and lime among other things. I'd love to make pasta salad with the bow ties. We have lots of cucumbers, tomatoes, green peppers, and carrots. With an olive oil dressing. I bet it would be delicious. Oh that salad looks great ... and I could probably veganize it. Mmm! I'd use the bow ties first and make Vegan Kasha Varnishka. Mmm! Ooooh, lemon pepper quinoa and brown rice pasta with Caribbean jerk chicken and plantains! I would use the Bowtie Pasta first. I would make Asian Bowtie Pasta Salad. It's so good! This looks so good guys!! I love Thai food, so I'd buy the bowtie pasta first and make THIS! Pinning! Looks delish! I would use the bow ties with a lemony cream sauce.